I have recently purchased a used Health Wave infrared sauna from a friend who was downsizing, without really investigating any pro's & cons beforehand. This also means that I did not have any preconceived ideas of what to expect. However, I have found an immediate improvement with aches, pains & tired muscles & a lot less joint pain. I believe that there are a lot of other benefits, but this alone makes a whole lot of difference to my life & makes the purchase very worthwhile. The deep heat is wonderfully soothing & really relaxes you no matter how tense you are to start with. Too early to say about weight loss, but there is no doubt that you have a great feeling of well being after using the sauna. A wonderful place to switch off & truly relax. The sauna also has the benefit of a CD player, light therapy & aromatherapy to give you the complete relaxation experience if you want it. 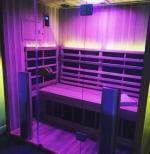 I am so happy with the immediate health improvements due to my sauna & look forward to enjoying it's ongoing benefits.